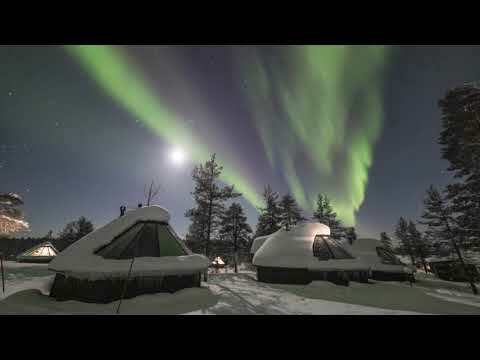 Christmas in Lapland is almost like a dream with the deep snow, reindeer, and the incredible Arctic light. There can really be fewer better places to spend the festive period. You will also be swapping the usual tradition of frantic last minute preparations and too much eating and drinking with snowshoeing, cross-country skiing, snowmobiling and husky sledding. This will definitely be a trip to remember for years to come. 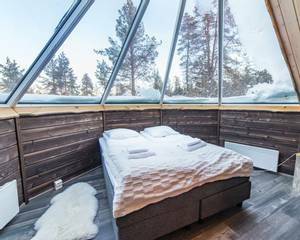 Spend a memorable Christmas in beautifully-remote Muotka, Finland. 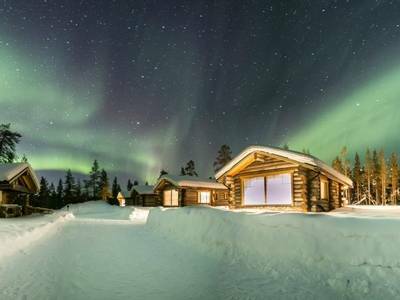 Snow-covered landscapes await as do a plethora of winter activities and Northern Lights hunts as you spend the festive season in an unforgettable way. 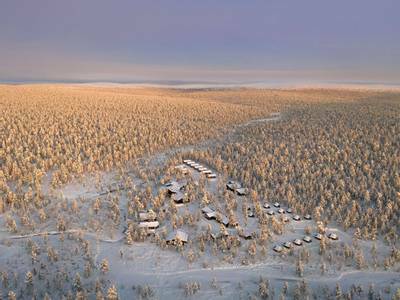 Muotka’s wilderness looks like it has come straight from the front of a Christmas card, so it really is a fitting place to spend Christmas. During your active 4-night holiday, you’ll experience the best this location has to offer, both day and night. 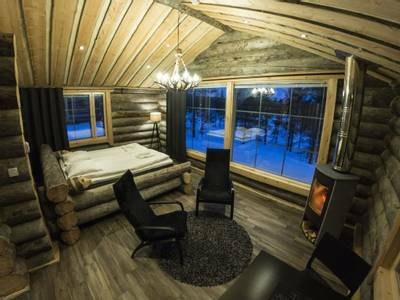 The snow here doesn’t just provide a picturesque landscape, it also provides a playground for some incredible winter activities and snowmobiling, dog sledding and cross-country skiing are all included in the itinerary. 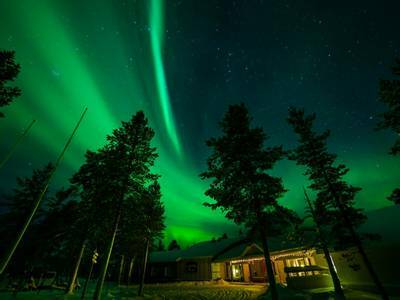 As you’re in prime Northern Lights territory, your night-time activities are all about searching for nature’s ethereal light show. 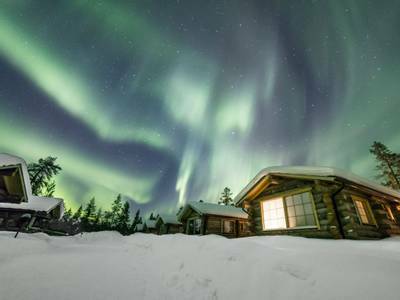 You’ll travel by car, using snowshoes and in a snowmobile-pulled sleigh to reach different lookout points. 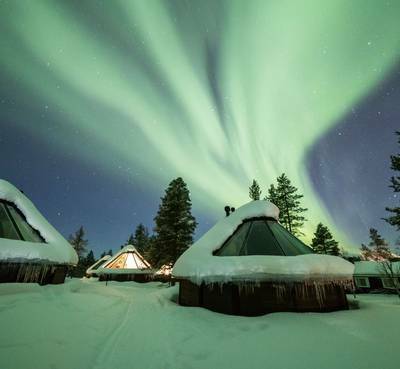 During all activities, you’ll be accompanied by an expert guide who will use their local knowledge to give you the best possible chance of seeing the Aurora. 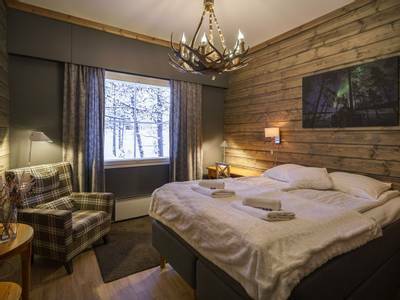 Your base is Wilderness Hotel Muotka which offers excellent hospitality and very comfortable rooms. 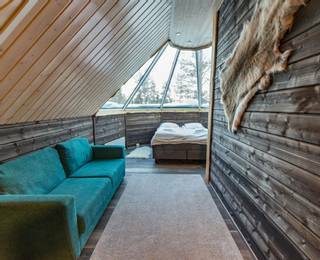 You also have the option to upgrade to an Aurora Cabin for a night or the duration of your stay. 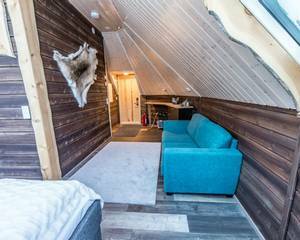 In the cabins, you can lie in bed and gaze up at the Arctic sky – you may even see the Northern Lights as you’re wrapped up in your duvet. 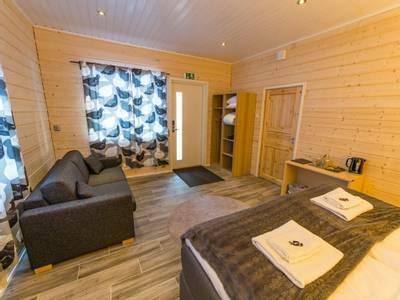 See our Accommodation and ‘Personalise’ section for more details. 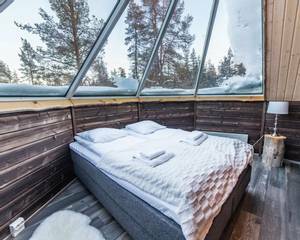 With excellent winter activities, a superb location and a fabulous Northern Lights track record, Muotka has everything you need for an unforgettable Christmas. 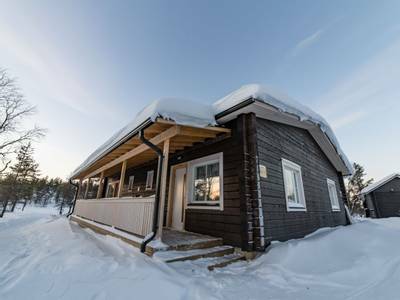 Upon arrival at the airport, you will be greeted and transferred* to Wilderness Hotel Muotka, approximately 40km away. 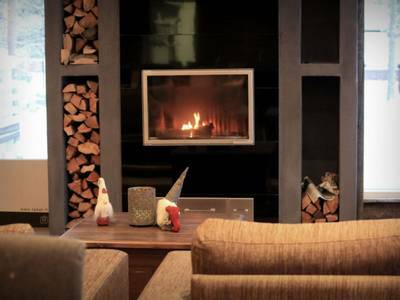 Enjoy your evening meal and settle into your surroundings. 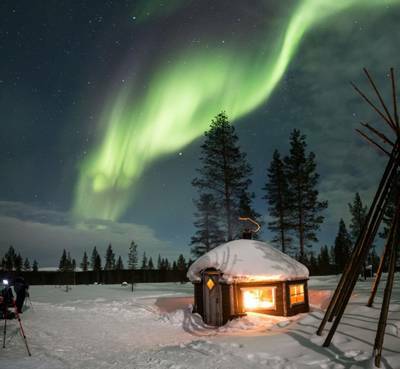 It might be a good idea to get an early night before tomorrow’s adventures, however, we always recommend keeping an eye on the sky as you never know when the Northern Lights might make an appearance. 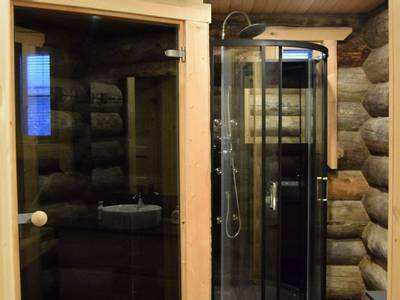 The Aurora Cabins here at Muotka are an exceptional upgrade option and provide very comfortable Aurora accommodation either for one night or your whole stay. 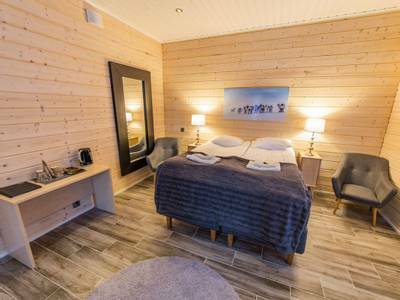 Details of these options can be found in the 'Accommodation' and 'Personalise' sections of the holiday page. * Transfers are based on a scheduled group shuttle to a few nearby hotels. If you would prefer to upgrade to private taxi transfers please ask our Aurora Travel Experts for a quotation. 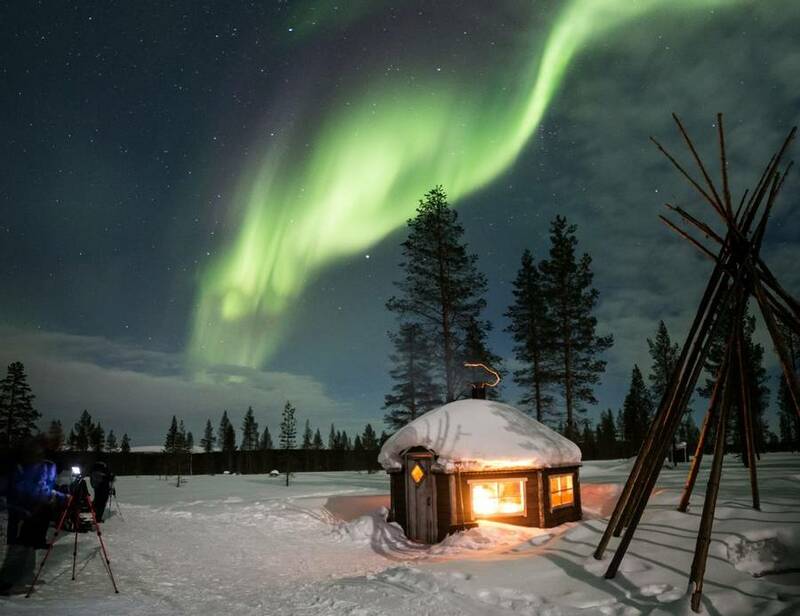 Following breakfast, you will learn all about the Northern Lights during an Aurora workshop. Your expert guide will talk about the science behind the phenomenon, as well as the myths and legends surrounding the Lights. You’ll also learn the optimal camera settings to help you capture any displays on camera (you will need your own equipment). 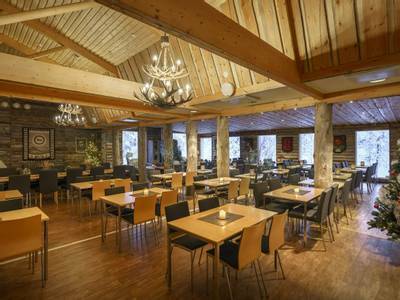 Lunch will be served at the hotel and then it’s time to explore the beautiful surroundings on cross-country skis. 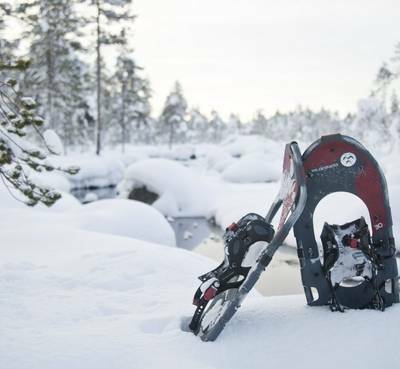 The Finns love this form of transport and you’ll soon see why as you’re able to glide across the snow with ease. Admittedly, it does take a little bit of getting used to, but once you get a feel for it you might want to head out for more exploration independently and you can hire equipment locally. 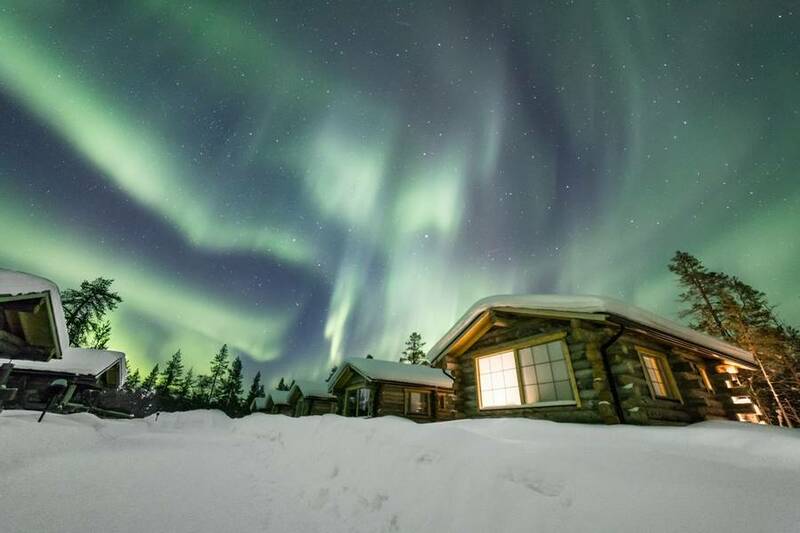 After dinner, you’ll embark on your first Northern Lights hunt. 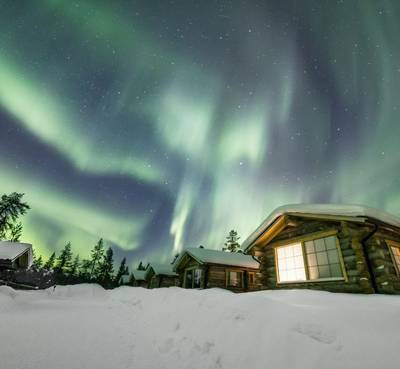 You’ll travel in a snowmobile-pulled sled as your guide leads you to an Aurora camp, selected for its prime view of the sky. 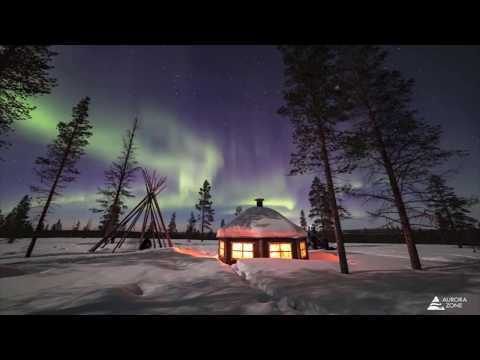 Here, you will sit around a campfire as your guide tells you stories and you watch the night sky. Should conditions be favourable, you will be in the best possible location for viewing a display. After breakfast it’s time for a thrilling snowmobile adventure. You’ll receive full instruction and a safety briefing, before setting off travelling two per snowmobile. There is the opportunity to swap drivers halfway, provided you both have a full driving licence and are over 18. 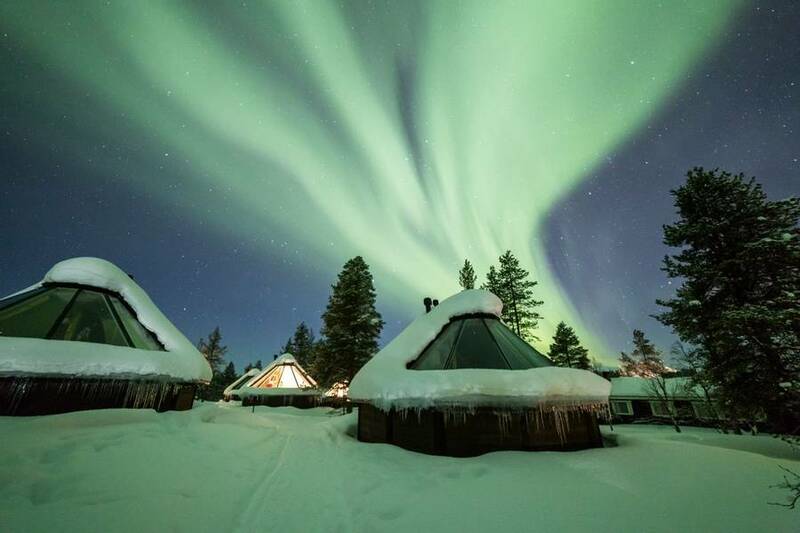 You will cover approximately 20km to reach a reindeer farm where you will meet a local herder and their animals. 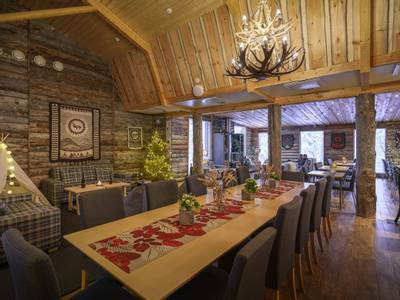 You’ll get to appreciate the importance of reindeer herding to the region, as well as enjoying a short sleigh ride, before heading back to Muotka on your snowmobiles. You will be out for around five hours in total and a soup lunch is included. 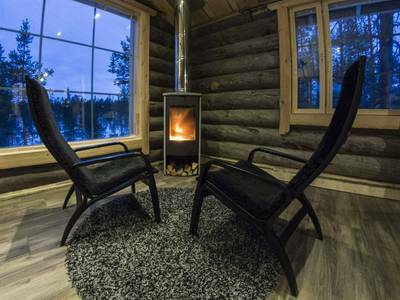 Traditionally in Finland, Christmas is celebrated on Christmas Eve so you will have a special festive dinner tonight before your night-time excursion. 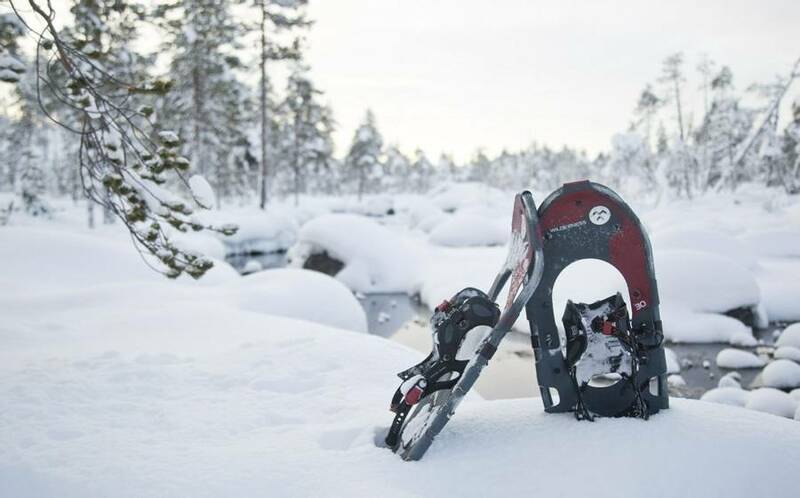 Snowshoeing is an excellent way to traverse across the deep snow and see more of the wilderness. You’ll follow your guide on the hike along snowy trails illuminated by your head torches. 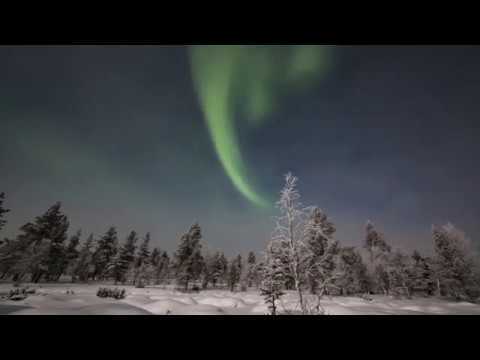 If conditions are favourable, the Aurora may also provide some extra special light. 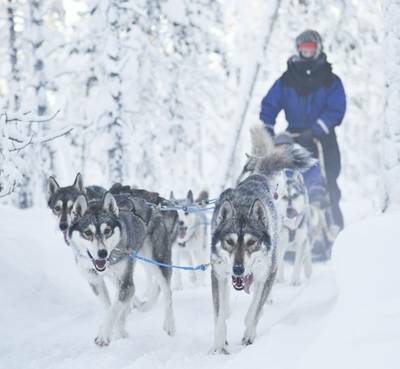 Following breakfast, you’ll it’s time for your unforgettable dog sledding adventure. You will receive full instruction on how to drive the sled before setting off on the trails. 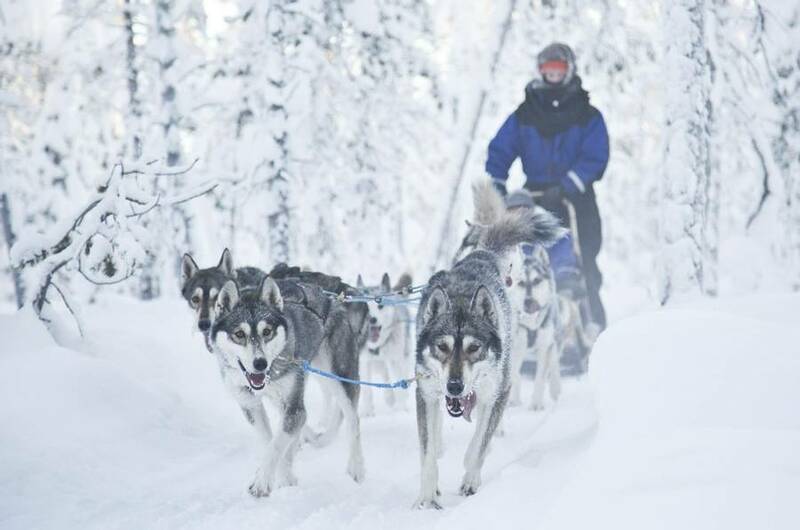 You will travel two per sled, with a team of four to six dogs and you’ll quickly see how the dogs calm their excitable barks once they get running. Afterwards, you will enjoy a soup lunch at the husky farm. The distance travelled will be determined by the conditions on the trail, but you will be driving for around 1.5 to 2 hours with the dogs. 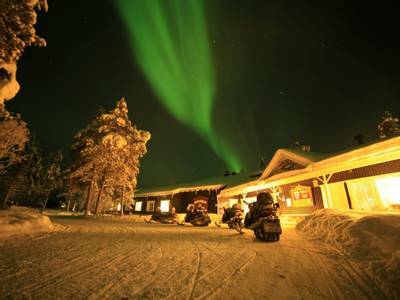 Dinner will be served back at the hotel before your final Northern Lights hunt. Tonight you will travel by car and use its mobility to your advantage as your guide will use their expert knowledge of the area, along with the latest weather and solar activity forecasts to decide on a location. 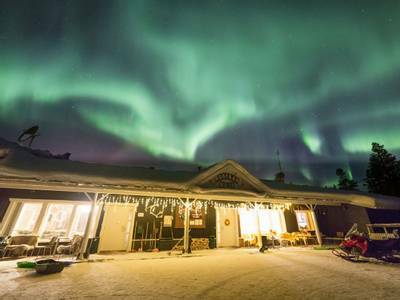 If luck is on your side, your Christmas Northern Lights wishes may come true! 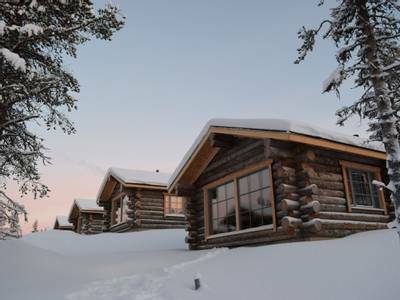 Today it is time for your Christmas adventure at Muotka to come to an end as you are transferred to the airport for your flights home. If you are departing on an early flight, you will be provided with a breakfast box. A lovely holiday. Great family activity for families with older children (we had teenagers). Loved seeing the Aurora and having Matt happily take photos for us so that we could just be in the moment was fantastic! We loved the trip as it was a once-in-a-lifetime experience.